If you haven't been keeping track, the dead are coming back to life across DC's landscape. That means if you're a hero and you've ever met someone who's since departed this mortal coil, chances are they'll be knocking on your door within the next few days, a brand new ring on their finger and maybe a few basic grooming issues to think over. 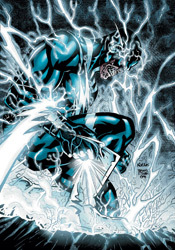 Although the primary story has finally reached the second act in the primary Blackest Night series, where the heroes have taken the fight to the reanimated mob, this issue takes place before any of that. After all, why move the story forward when you're doing just fine with a lengthy and repetitive introduction? Of course, longtime Flash readers will be less interested in that than they are the return of scribe Geoff Johns to the land of the scarlet speedster. Johns's return, however brief it may turn out to be, helps this installation of the crossover to stand out more than the majority of its competition. For a character such as the Flash, possessor of a large, colorful gallery of rogues both living and dead, this level of intimate knowledge is crucial. A less experienced writer would have spent the entirety of this issue just getting to know the bit players, while Johns can swoop right in and concentrate on getting their stories straight. Rather than following the reactive storytelling embraced by the other authors in the Blackest Night tie-ins, this installment takes a more proactive look at the dark events transpiring around the glove. Barry Allen isn't content to sit back and wait for his fallen enemies to seek him out, and Geoff Johns isn't happy to fill the story with random fists punching their way out of the grave every couple pages. Instead, he tells us a bit more about the dead themselves, be it through Barry's memories of his last encounter with the fiend, the gut reactions of the rogues still among the living (who aren't always especially happy to see their former rivals returning from the grave), or the lost memories tied to the corpses themselves. This isn't always a flash-bang action flick, and that alone is enough to make it special. Himself no stranger to the Flash, pencil-man Scott Kolins brings a style to the issue's artwork that's often eerily similar to that of Andy and Adam Kubert. The reunion with his former collaborator is a good fit for Kolins, who also lends a sense of familiarity and comfort to the proceedings, slipping back into the scene in the same way he would an old pair of gloves. It's a good thing, too, because he reunites with every last of those acquaintances in this issue. Covering almost every corner of the Flash's cast - living, dead, friend, enemy - this tale frequently and rigorously puts Kolins's memory to the test, and he nearly always manages to use it as motivation to produce something excellent. With so many characters vying for our attention, the issue certainly runs the risk of running short on elbow room. And, on a few occasions, that's the case - but for the large majority of it, Johns and Kolins manage the numbers better than I could've imagined. More importantly, they do so without handicapping the main narration along the way. While it's awfully crowded, this is a solid first issue that unleashes several intriguing new plot lines and offers new peeks behind the mask of several important characters. It's not just for Flash die-hards, casual fans will find plenty to enjoy here, too. It's one of the few tie-ins to really explore the full potential of this crossover. Borrow it.